The first half of this game will surely go down as one of the best halves of football seen at Africa Cup of Nations in recent years. 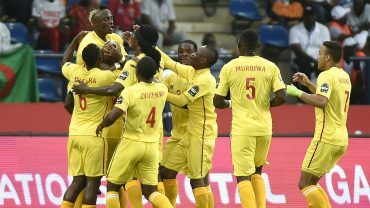 As well as featuring three goals, we witnessed a fantastically adventurous and positive display from tournament minnows Zimbabwe, bamboozling Algeria with some gloriously flowing and open-minded attacking football. Despite giving away an early lead, the way in which they came forward was magnificent to watch, as they proved unperturbed by going behind early on. Lead by the effervescent Khama Biliat and accompanied by the nippy, lightweight Kudakwashe Mahachi and the bustling, not-so-lightweight Nyasha Mushekwi, they drove forward towards Les Fennec’s defence with great purpose, clearly deserving their 2-1 lead at the break. Given their underdog status, you wouldn’t have blamed them for taking a more negative approach, but the way they let their natural style prevail was very admirable. Billiat in particular really lived up to his pre-tournament hype. The best player on the pitch in the first half, his impressive acceleration and agility made him basically untouchable, as he roamed around the pitch to dictate the tempo with which his team played – unlucky to not be on the scoresheet after hitting the bar with a magnificent volley. Here’s to hoping they continue to surprise with performances like this. With such an array of talent on the pitch, Algeria proved that they have not quite got themselves together ahead of this tournament, producing an awkward, disjointed and wasteful performance in their first match of this tournament. Having gone through a few coaches in the past year, this is possibly not entirely surprising, but given that the team is made up of largely the same players one would expect more cohesiveness. Nabil Bentaleb and Adlene Guedioura stayed way too deep, with Yacine Brahimi, Hillel Soudani and Islami Slimani doing little to assist Riyad Mahrez, who was the only one doing anything productive with the ball. At the back, inexperience told, as new men Ramy Bensebaini and Mokhtar Belkhiter struggled to get up to speed, not managing to deal with the considerable handful that is Mushekwi. Whilst they improved significantly after half-time, as Bentaleb pushed on to support the attack more, their limp finishing fell into the ‘poor’ category as opposed to ‘unlucky’. Slimani failed to inspire, a poor performance made up of minimal movement and minimal service meant that Algeria were particularly blunt through the middle, despite every combination of positioning being tried amongst the front four. Their quality eventually told, but Georges Leekens will be hoping this is just a bad start rather a sign of things to come. As his fellow attackers miscontrolled and scuffed their way about the pitch, Mahrez was his electric best, terrorising the Zimbabwean defence from minute one. Concerns about his lack of form for a disappointing Leicester side have proven to be unfounded, as he reverted to the player of last season that won his side the title, scoring two excellent goals to earn his side a point. Spending most of his time on the right, The Warriors backline didn’t know what to do with him, as his classic cut-inside routine proved extremely effective. Often having to do it on his own, he constantly found himself in space, jinking and switching his way around the penalty area. Algeria will need to find other sources of offence than relying on the one player though, if they want to even get out of this group. A disappointing first half performance set the tone for Tunisia. Throughout the game they probably had more play than Senegal. Their passing was at times intricate and incisive, and the pace and invention of Naim Sliti and second half substitute Wahbi Khazri created the odd opening. But it was always fleeting, and even when the opportunities arose, they never exploited them. Ahmed Akaichi – the Helicopter – was his usual frustrating self, running around a lot and getting himself in good positions, but then missing chances that a striker at this level has to be taking if their team is going to beat good opposition like Senegal. Youssef Msakni showed glimpses of his considerable ability, but also drifted in and out of the game as per usual, and missed two further big chances. Young Larry Azouni was taken off at half time after producing little. All in all, they were just too lightweight and nowhere near clinical enough going forward, wasting the control Ferjani Sassi and Hamza Lahmar asserted in the midfield. Add in the uncharacteristic defensive sloppiness that led to the two goals and it was a recipe for a very disappointing defeat that leaves them needing to win their next two games to go through – including that crunch tie against bitter rivals Algeria. Senegal’s wingers looked very lively, even if they didn’t actually create a huge amount of chances. It’s easy to forget that Sadio Mane is just 24, and though his goal was a penalty, he still looked like the most talented player on the pitch. On the other side, 21-year-old Keita Balde didn’t look to be phased by the occasion in his first international tournament. In the second half, Keita was replaced by 18-year-old Metz winger Ismaila Sarr, who injected fresh pace into the Senegalese attack and nearly scored with a looping cross that deceived Mathlouthi and hit the bar. At the back, Kalidou Koulibaly (25) had a great game, while Abdoulaye Diallo (24) was solid in goal. With Moussa Konate (23) yet to come into this side, it looks like Senegal have plenty of talented youngsters they can build the team around for the next few years – and that’s in addition to the likes of Gana Gueye, Kouyate, Gassama, Mbodji (all 27) and M’Bengue (28) who have all got a couple more AFCONs in them yet. This team has progressed since 2015 and could well be a real threat for the title – they beat a good team without playing particularly well this time. Eurosport co-commentator Bryan Hamilton spent most of the game talking up Tunisia despite the fact that they were two goals down. He had a point – on another day, a couple of their big chances find the back of the net, Aymen Abdennour doesn’t make a poor tackle to concede a penalty, and Tunisia win. But that to me does Senegal a disservice. Not only did they take their chances – something Tunisia clearly did not do – but they defended well. Defending isn’t all about not letting the opposition get shots in – it’s also about making the opportunities for shooting difficult when they do arise. Granted, Akaichi, Msakni and Khenissi did get free headers, arising from poor marking, but in open play Senegal composed themselves well to keep themselves compact. They restricted Tunisia to more difficult chances, without dropping particularly deep until the very end. Tunisia should have no complaints about this result – it’s all on them. They conceded two poor goals, failed to open Senegal up and demonstrated a woeful lack of composure when the chances presented themselves. Perhaps it was one of those days for them where nothing went right, but Zimbabwe demonstrated today that they are no pushovers, with a solid defence and a creative star in Billiat, so they will definitely have to make chances and improve.